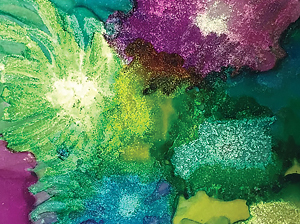 Jacquard Piñata Alcohol Ink Colors are highly saturated, fast-drying acid-free alcohol inks for use on any non-porous surface, including Mineral Paper, Yupo Paper, glass, metal, plastic, ceramic, stone, leather, polymer clay and more. Piñata Colors clean up with alcohol and re-wet themselves, allowing for unique effects and techniques not easily achieved with water-based systems. 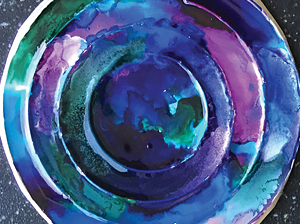 Alcohol Inks work best on non-porous and smooth surfaces. Try them on metal, acetate and glazed ceramics. Acetate has been used in this example. 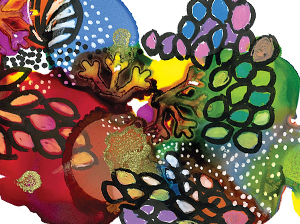 Alcohol Inks work best on non-porous and smooth surfaces. Try them on metal, acetate and glazed ceramics. Aluminium Embossing Foil has been used in this example. 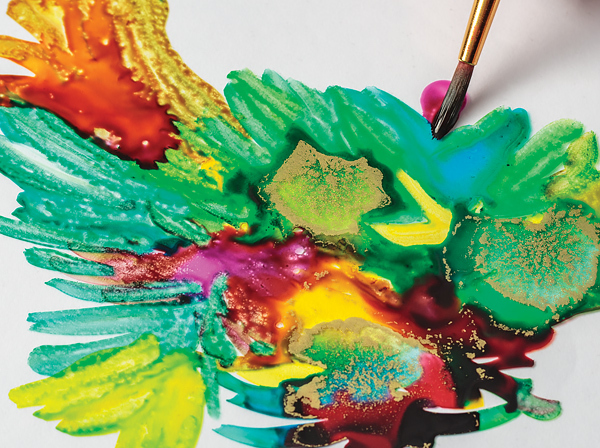 Alcohol inks can be applied with a brush. It is recommended that you use old brushes as they will retain some of the alcohol even when cleaned. Use Rubbing Alcohol to first clean the brush, then the Brush Cleaner as a final rinse.